The bizarre high school basketball career of Jimmy Sorunke, who went from an overhyped freshman to an ignored senior in just one year, appears to now be over. American icon Andrew Young was in Austin last night opening a Summit on Race at the LBJ Library. The Washington Post released its final rankings for the 2018-2019 high school basketball season earlier this week. DeMatha, a school with perhaps the most storied program in the country, ended up in the top spot in the historically hoops-crazy D.C. region for what was officially the 28th time. On February 11, Deadline.com reported that Corey Maggette had been taken off the air by Fox Sports West, where he works as a commentator for Los Angeles Clippers games. Adrian Dantley just refereed my son Eddie’s rec league game. An NBA all-timer and maybe the best little big man in the history of the game, working a weeknight seventh-grade playoff at D.C.’s Jelleff Recreation Center. King Kong Bundy, the biggest man I ever saw undressed, is dead. He was 61. No official cause of death has yet been issued. James Arthur Ray put out a promotional video advising why folks desperate to improve their lot in life should seek counsel from him and others toiling in the charlatan-rich self-help field rather than try to go it alone. Skip Groff has gone the way of the neighborhood record store. He’s dead. I’ve carried a grudge against Frank Robinson for 49 years. I was born and reared in Virginia and still hold fondness for the state as often as it embarrasses me and anybody who claims it. Times like these. That blackface/klansman photo that will end up getting the governor bounced was in a yearbook, after all, from a state school. The two greatest days in Dan Snyder’s life are the day he buys a boat, and the day he buys a bigger boat. Robert “Colonel Rob” Schaffner, an L.A. outsider art deity and the guy who got Heavy Metal Parking Lot to whatever masses it got to, is dead. Washington defensive lineman Jonathan Allen gave out doughnuts to sick kids in D.C. today. 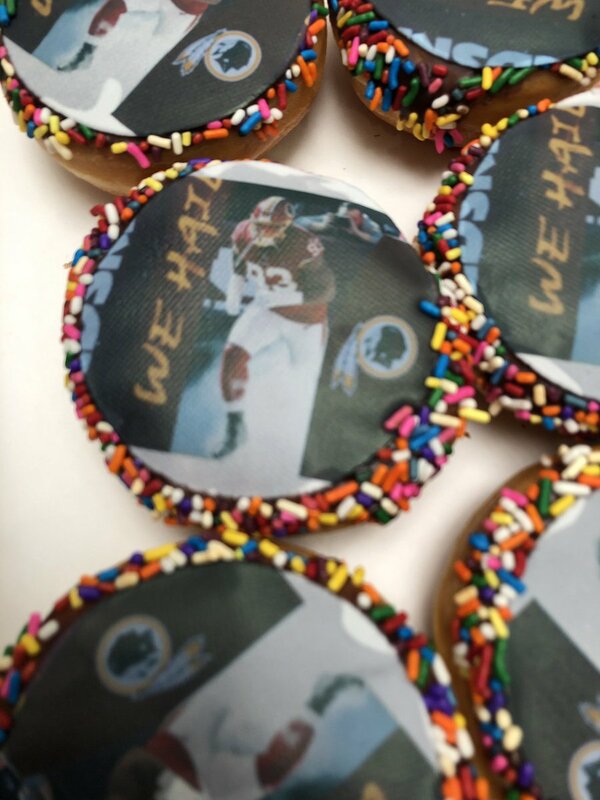 The treats came with a photo of him alongside the words “We Hail!” Allen probably should’ve checked with his boss. Sean Taylor died 11 years ago today after being shot in his Florida home. For those looking to honor his memory on this awful anniversary: Dan Snyder is selling a crappy Sean Taylor doll. Brett Kavanaugh’s still got coaching on his calendar after all. Rachel Mitchell, the GOP hired gun who shot blanks during last week’s Brett Kavanaugh hearing, told Republican senators immediately after the public fiasco (but before the FBI investigation had begun) that she would not have prosecuted the nominee for his alleged assault of Christine Blasey Ford.